I am now a proud owner of this Canon X-07 hand-held computer. I found it from an online auction for an unmissable price. It was advertised as pristine condition with original box and manuals. This machine is quite rare, but has seen popularity in Finland and France. I’ll try to document this computer as thoroughly as possible. The Canon X-07 was launched in 1983. It was sold for about 2200 French francs in September 1983. Adjusted to 1983 conversion rate, and US dollar inflation, the price was generous $600 in 2015 dollars. The price went down quickly, and in March 1984 it cost only half of its original launching price. It was quite modern for a hand-held computer of its day, and had lots of potential due its vast expansion options. Not much information can be found about this computer, and it seems to be left as a forgotten niche little machine. There is not even an English Wikipedia article about it. 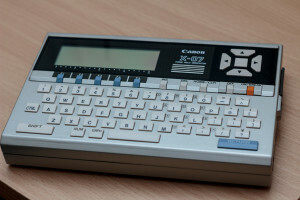 I speculate it did not gain similar popularity as other home computers of the era due competing markets with BASIC programmable calculators. However, the Canon X-07 is not a calculator, but almost full-fledged portable computer. The Canon X-07 is powered by a Z80 code compatible NSC-800N processor running at 3.84MHz. 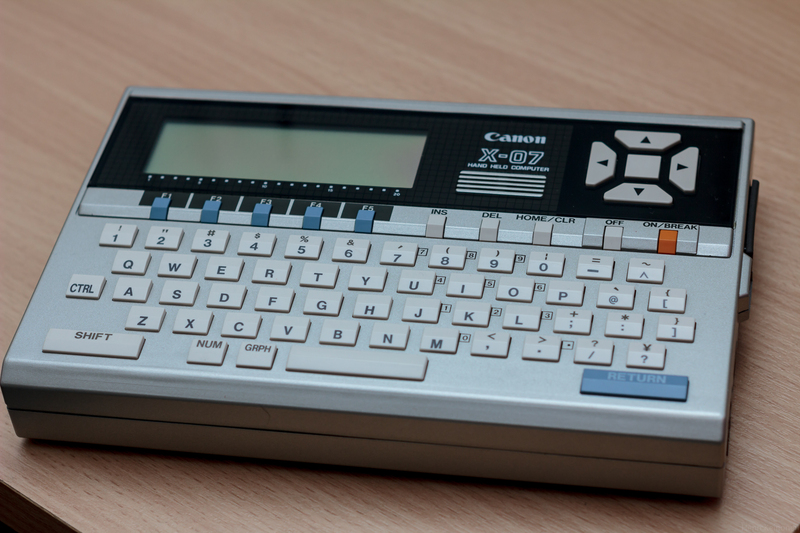 It has a Toshiba T6834 co-processor driving internal 120 x 32 dots monochrome display and calculator-esque 49 key keyboard. The display is a mix of graphic- and text-mode , and in basic mode it shows 4 lines of 20 characters. The co-processor also provides an internal buzzer that plays keyboard beebs, and can also play melodies and other tones. The T6834 also contains a real-time clock and alarm functions. The whole computer works with 4 AA batteries. I do not yet have any information on the battery life. There is also an external power connector to power the computer from the mains. Canon X-07 comes with only 8KB of memory, but this can be expanded up to 24KB with additional 8KB SRAM IC and 8KB battery backed memory expansion card. Unofficial third-party memory expansion existed providing huge 128KB capacity. The memory can be used as storage, allocating part of it as virtual disk space. The amount of space can be configured through BASIC command. By default, 6748 bytes are usable for programming and storing data. The memory retains its content as long as power is provided. The batteries can be changed without memory loss if external power adapter is used. The storage options include a cassette recorder interface. A mini-din connector provides connection to recorder, that could be used to store programs and data. Data is encoded with 1200 baud FSK modulation. Programs and data can also be transfered with 100-2400 baud RS232 port (which is TTL level) to other devices. An infrared coupler X-721 was sold separately, allowing wireless communication between two X-07’s. A RS232 level converter X-722 was sold for connecting to modems or other computers. 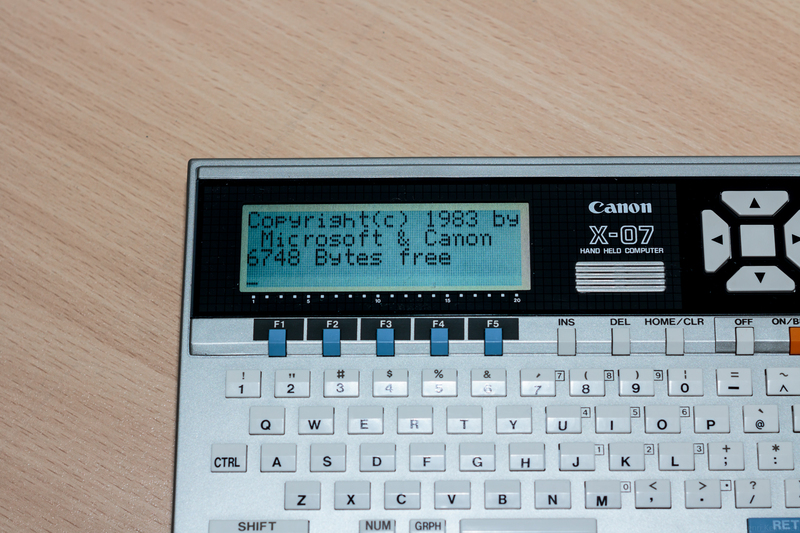 Canon X-07 had also two printers as optional peripherals. Color graphics printer X-710 was more like a plotter with 4 pens, and was controlled with X-Y coordinates. A more traditional X-711 thermal printer could be used as text printer. X-07 also has a centronics compatible LPT parallel printer port. In the back of the X-07 there is a 40 pin extension bus port. It is 8085 bus compatible, and breaks out all data and address lines with some control lines. It was used to connect the X-07 to X-720 video interface that allowed the computer to be connected to a TV receiver. It had multiple video modes, ranging from 32×16 character mode to 68×48 mixed pixel mode with 8 colors and all the way up to 4 color 128×192 graphics mode turning X-07 into more traditional home computer. Finally, there was Polars Sport Tester PE-3000, a sports clock with wirelesses heart rate monitor, that could be connected to the Canon X-07 turning it to complete portable sports analyzer that could print interesting graphs from the athletes performance. I still have one complete with X-710 printer complete with case and manuals. Hi gerard, would you sale it?